Spend some time observing your garden at different times of day to see where the shady spots are and which are the sun-drenched hot spots. Check out wind directions in the different seasons to see where windbreaks can make a difference. 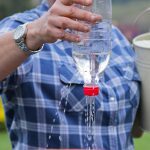 Consider using the slope of the land to irrigate your plants by trapping and directing rainwater in shallow furrows. Sketch your garden on paper, noting existing features such as large trees, pools, taps, pathways and benches. 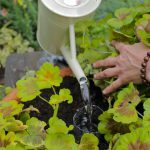 Look at where you can lead grey water from bathroom outlets using gravity, or if you will need a pump, and which are the best spots for rainwater tanks and a handy garden shed. This may be a good time to decide what features stay and what goes, or if anything needs moving or adding. 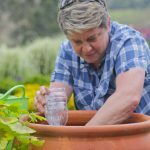 Adopt a waterwise approach to landscaping your garden. Plot zones on your plan indicating what you’ll use each area for. It’s common sense to put the herb and veggie garden near the kitchen door. The next zone is the one around the front entrance: This is where you set the tone or theme of your garden. An entertainment area is another. Do you need lawn for children and animals to play on? If you do, consider keeping it to a minimum as shallow-rooted grasses need regular watering to look good. You may also want to keep a corner of the garden as wild and natural as possible to provide a refuge for birds and other creatures. Group together plants that have similar water needs. For instance, a bed of wild irises (Dietes grandiflora) and hardy pelargoniums will require very little watering once established, whereas bedding plants like pansies will need watering two to three times a week. 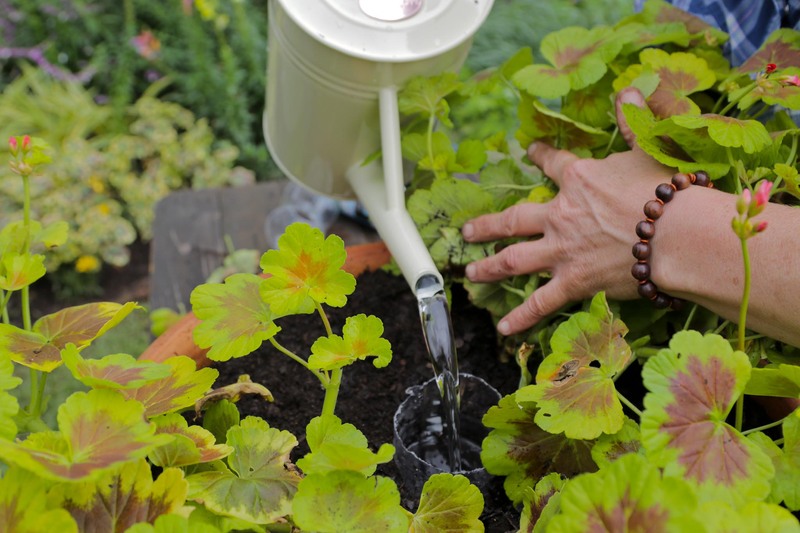 View guidelines on how to choose water-saving plants. Outline garden beds using a rope and pegs for straight lines, and a hosepipe for curved lines. 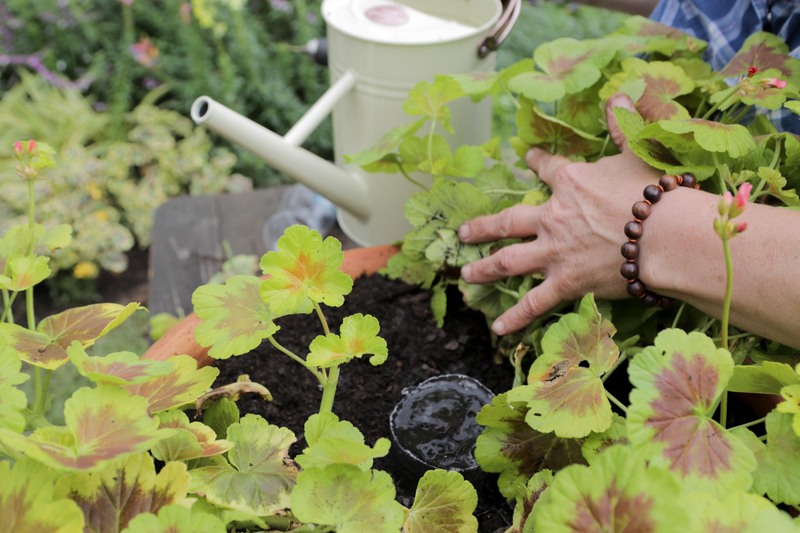 Add plenty of compost to improve the soil’s ability to retain moisture and feed your plants. 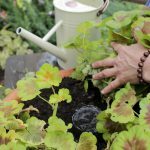 Buy plants for each bed, according to your plan, and add a little fertiliser to each hole as you plant to give them a good start. Give them a welcome drink of water to settle them in. 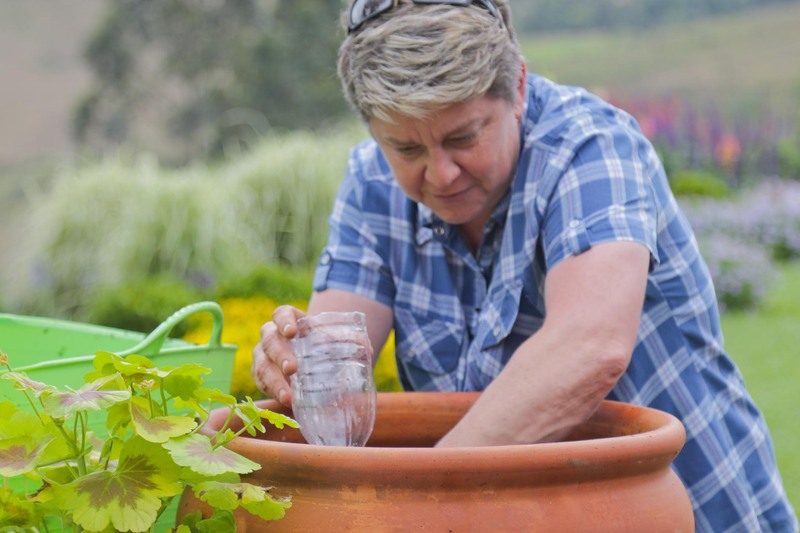 Get some tips on what to plant for a waterwise garden. Spread a thick layer of mulch over the whole bed to ensure moisture does not evaporate too quickly and to keep weeds down. Coarse compost breaks down slowly, feeding plants, but chipped bark also works well. Straw is great for veggies and strawberries as the fruits can rest on it. 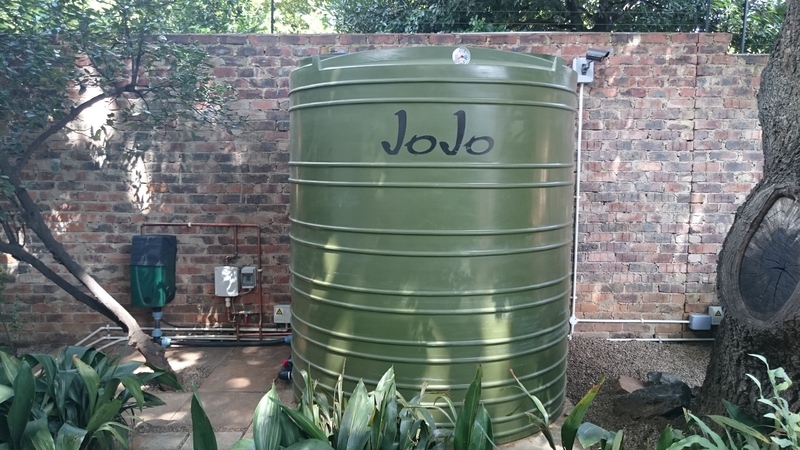 Before we start work on the bin, a raised wooden base is needed for the DIY rain harvesting bin, as this helps to get easy access to the tap which will be situated close to the bottom of the bin. To do this you can make a stand out of pallet wood pieces cut to size. For this project multiple pallet wood lengths of 500mm were cut and screwed together with long wood screws and a power drill. On to the bin… Drill multiple “drainage” holes using the spade drill bit, in the lid of the plastic bin. When the lid is flipped and placed on the bin, the lid now acts as a funnel to help collect and drain the rainwater into the bin. Next, decide where you want to position the tap and use a spade drill bit (inserted in a drill) to make the hole. 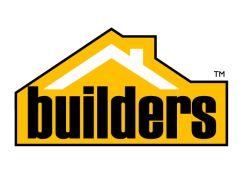 Tip: for this project a spade bit that is slightly smaller in size compared to the diameter of the tap’s end was used to ensure a snug and tight fit. The back end of the tap was gently Screwed into the hole made. Use washers when inserting the tap, make use of a fitting to secure the other end inside the bin and apply some silicone to make sure everything is water tight and to avoid water leakage. 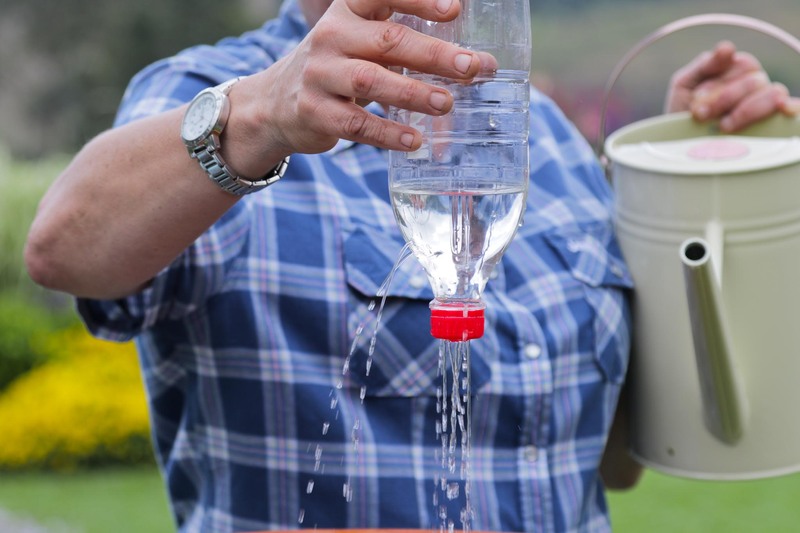 To stop mosquitoes and other insects from entering the rain bin, make use of an insect net and waterproof duct tape. Cut the insect net to the size of the bin’s rim, and secure to the rim with strips of waterproof duct tape. Place the lid on top of the netted opening. 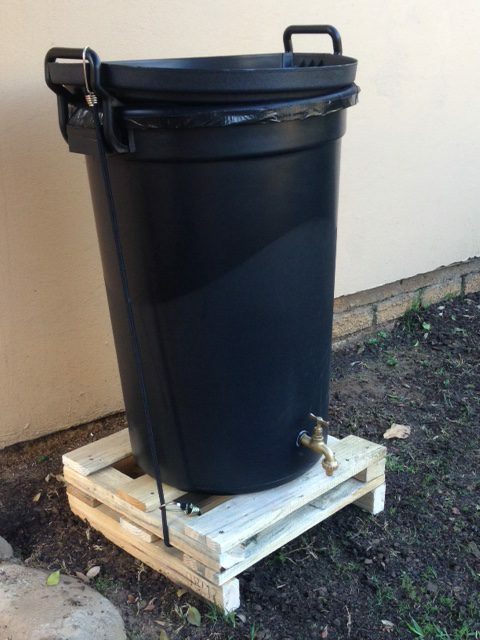 Place the rainwater harvesting bin on top of the raised pallet wood base and secure the bin to the base using a bungee cord on either side of the bin. attached to the handles and to the wood at base. This ensures that the bin won’t fall over in unpredictable weather or winds when the barrel is empty.